The walk starts from the parking lot at the front of the Indoor Ice Rink. Walk back towards the park entrance but turn right to follow the access road in the direction of fields 5 and 6 (notice the sign along the road). A service road intersects to the right before reaching the fields. Turn right to follow the service road. A trail intersects after a short distance. A baseball field can be seen just beyond this trail intersection. Turn right and follow this trail with the baseball field on your left. A trail intersects from the right. (The trail from the right was somewhat muddy at the time of our visit because of its use by construction equipment.) Turn slightly to the left to follow the present trail. Turn left at the next trail intersection. The trail signs indicate that this is the Gooseneck Loop Trail. After a short distance the trail will cross a narrow creek. There is no bridge at this location but the crossing is easy. A trail intersects from the right. Continue straight on the present trail. The sign indicates that this is the Hawk Ridge Trail. The trail ends at the Cabin John Trail. Turn left to follow this trail. You may notice blue marks on the trees indicating the direction of the trail. A trail intersects from the left. Continue on the present trail as it turns to the right and goes down a hill. The trail intersects with another trail at a bridge across the creek. Turn left to cross the bridge. On the other side take the middle of the 3 intersecting trails. Notice that the trail to the right has branches across it indicating that it is closed. The middle trail should have blue marks on the trees. After some distance you may notice a bridge below to your right. You should see a blue marker on a tree indicating that there is a turn at the next trail intersection. Take a sharp right at the next trail intersection and walk down to and cross the bridge. Continue on the trail on the other side of the bridge. 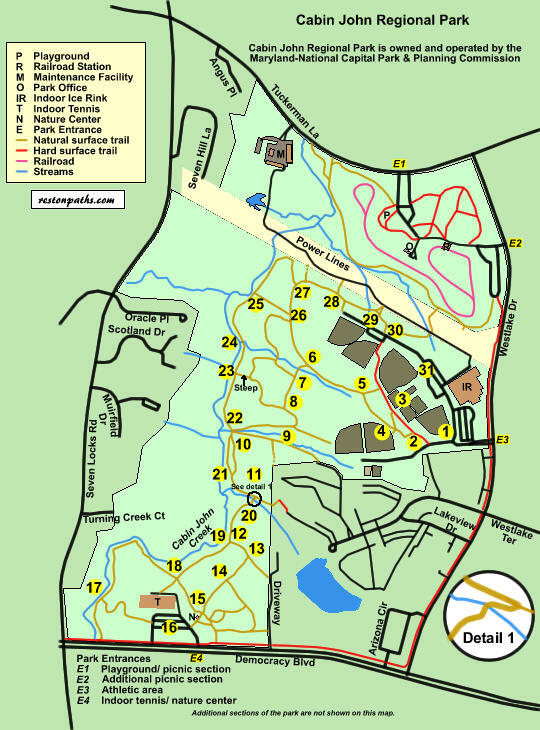 The trail intersects with another trail with a large park map at the intersection. Turn left to follow the Cabin John Trail up the hill. There are wooden steps on this portion of the trail. The Cabin John Trail used to go to the right at this intersection. Turn right at the next trail intersection to continue following the Cabin John Trail. Note that this is a new alignment for this trail and older maps show it taking a different route. A nature trail intersects from the left. Continue on the present trail and notice numbered signs indicating points of interest on the trail. The trail passes a storage building. In front of the storage building the trail is paved. Continue straight as the trail passes the nature center on the right. There are 2 intersecting trails on the left but ignore them. The Cabin John Trail turns to the left but you should continue straight on the paved trail as it crosses a bridge. After crossing the bridge walk through the Indoor Tennis Facility parking lot to the other side. At the other end of the parking lot a sign marks the Pine Ridge Trail. Follow this trail into the woods. This is the only trail into the woods on the other side of the parking lot. The trail intersects with another trail just prior to the Cabin John Creek. Turn right and stay to the right at the first trail divide immediately after that turn. The trail follows the creek on the left. Turn left at the next trail intersection to follow a trail across a bridge and through a field. The creek will continue to be on your left. Turn left at the next trail intersection. Notice the large trail map that you passed before. You will be retracing your steps for a short distance. You are back on the Cabin John Trail and will see blue marks on the trees. The trail crosses a bridge and turns to the right. After a very short distance turn sharply to the left at the trail intersection to continue on the Cabin John Trail. A trail intersects on the left with branches across it. This trail is closed. Continue on the present trail to the right. Several trails intersect at the next bridge. After crossing the bridge turn left to follow the trail along the creek. You are leaving the Cabin John Trail at this point as it turns to the right. A steep narrow trail intersects from the right. Continue straight on the present trail. The trail crosses a narrow creek. There is no bridge but the crossing is easy. Turn right at the next trail intersection and follow that trail up the hill. Turn left at the intersecting trail on the top of the hill. You are now back on the Cabin John Trail. Two trails intersect from the left separated by a short distance. Continue straight past both of them. A trail intersects from the left. Continue straight on the present trail. A trail intersects from the right. Continue straight on the present trail. The trail crosses an earth dam. After crossing the dam take the intersecting trail to the right to join a dirt service road. Turn right to follow the service road past the intersecting trail on the left. At this point you have left the Cabin John Trail for a final time. Turn left at the park access road and follow it towards the Indoor Ice Rink in the distance. As you walk towards the Ice Rink note the Shirley Povich field on the right. Shirley Povich was a highly regarded sports columnist for the Washington Post who continued to write his column until his death at age 92. This concludes the walk.